White car that was involved in a serious collision. If you are the victim of a serious car accident, you will quickly realize that the insurance company is not on your side. The unfortunate reality is that the insurance company, along with its adjusters and lawyers, will do everything possible to undermine your case and minimize its value. From a business perspective, this makes complete sense. The insurance company wants to limit its monetary exposure to the greatest extent possible. One way that it does so is by significantly limiting personal injury payouts. 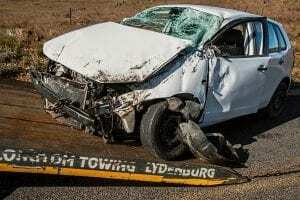 The experienced car accident lawyers at Bice Law understand that insurance companies are never interested in doing the right thing after a serious car accident. Our legal team can review the facts of your accident with you and help you decide on the best strategy for maximizing your case’s value, forcing the insurance company to pay you what you deserve. One way that the insurance company may try to undermine your case is by requesting a recorded statement from you. Accident victims are not required to provide a recorded statement, contrary to what an adjuster may tell you. You should never agree to provide a recorded statement to another insurance company following your car accident. These recorded statements serve no purpose other than to potentially gather information which the insurance company can later use against you. You should avoid them at all costs and call an attorney. Following some car accidents, the insurance company will put an extremely low settlement offer on the table, hoping that you will accept it. When it comes to low settlement offers, the insurance company only has its own interests at heart. Adjusters are hoping that you will accept the low offer so that they can dispose of your accident case quickly and remove your file from their desk. You should never accept an initial settlement offer that an insurance adjuster puts on the table, as there is almost always additional money that can be negotiated. An experienced Carolina car accident lawyer can negotiate with the insurance company on your behalf and highlight all of the positive aspects of your case. When the insurance company is fighting you every step of the way, the experienced car accident lawyers at Bice Law can help during settlement negotiations and throughout litigation. To schedule a free consultation and case evaluation with a Carolina car accident lawyer, please call us today at 704-243-8778 (North Carolina) or 803-639-8777 (South Carolina), or contact us online.